We’re so excited about Accent PDF Password Recovery that we’ve been telling everyone how our solution for recovering passwords to PDF files runs at top speeds and supports any type of PDF. Now it’s time we show you the data to prove it. We speed tested Accent PDF Password Recovery for every existing version of the PDF format on computers with a wide range of processors, and we’re going to share those numbers with you. Before you look at our test results, you should know that there are multiple versions of the Adobe PDF format, and each version has its own encryption algorithm. Password recovery speed depends to a great extent on these algorithms. Early versions of the Adobe PDF format used the RC4 algorithm for encryption. By today’s standards, RC4 has a short 40-bit key. That means that we can attack both the password and the encryption key. As a result, Accent PDF Password Recovery shows its highest speeds recovering passwords to Adobe PDF 1.1 - 1.3 files. Subsequent PDF versions included significant changes to file protection: in addition to the RC4 algorithm, these files have block AES with a 128-bit key and the algorithm for computing the key was reinforced (MD5 + RC4 were replaced with 50xMD5 + 20xRC4). These reinforcements seriously affect password recovery speeds for Adobe PDF 1.4 - 1.7 files. Adobe Acrobat 9 introduced a new format, Adobe PDF 1.7 EL3, with improved security. The encryption key was boosted to 256 bits and the MD5 hash algorithm was replaced with the newer SHA-256. However, the developers made some mistakes and the password recovery speed is dramatically shorter! Most of the time, programs generate encryption keys for their documents by running an original key through special hash algorithms dozens or even hundreds of times. Sometimes the post-hash key is even further encrypted. This process is called key stretching. When a password is entered, the key must be “stretched” by running it through the exact same number of hash or encryption iterations before the file contents can be decrypted. But Acrobat 9 contained a serious mistake. The developers decided not to use key stretching, replacing 50 iterations of MD5 with a single round of SHA-256. They also decided not to decrypt the key. Because of that oversight, any processor with SIMD instructions or AVX2 technology recovers this type of password at impressive speeds. That’s why the CPU i7-4770 with AVX2 runs so much faster than the i7-860, which only has support for SSE2. In a nutshell, Accent PDF Password Recovery leverages all the processor’s available resources to deliver top speeds when recovering passwords to any type of protected Adobe PDF file. The latest versions of the Adobe PDF format offer improvements on earlier versions. Developers brought back the key stretching algorithm and made it a serious barrier to password recovery. Now, the encryption key is generated by a single iteration of SHA-256 followed by a variable set of key transformations using the algorithms SHA-256, SHA-384 & SHA-512, which limits the use of SIMD. AES key encryption was also added (this explains the faster brute force attacks on CPUs with hardware AES support — i7-4770K and others when compared with i7-860 and Core 2 q9400, which don’t have hardware acceleration of AES). 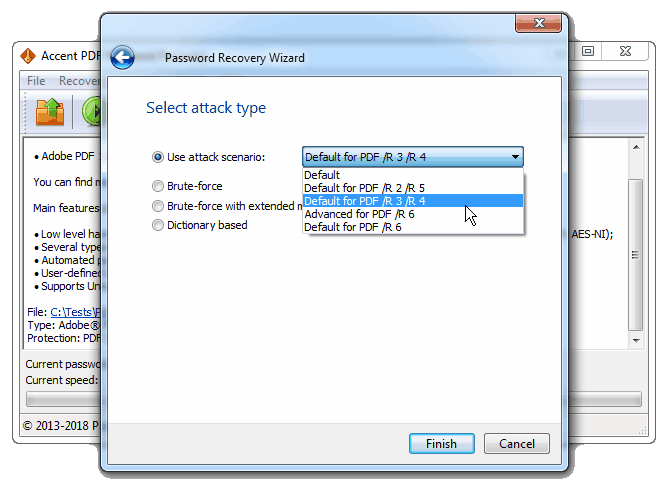 As a result, it takes much more time to recover passwords for the Adobe PDF 1.7 EL5/EL8 format. The good news is that Accent PDF Password Recovery still recovers passwords at top speeds for the encryption used in Adobe Acrobat X-XI. PDF files are actually encrypted using an encryption key that special algorithms generate from the user’s password. When the right password is entered, then a program like Adobe Reader calculates the key and uses it to decrypt and display the PDF file. If the wrong password is entered, then the key generated will also be wrong and the file is not decrypted. The number of variables that must be tested to find the key depends on the key’s length and is calculated using the formula 2key length. That’s good because it means that the number of variables is always finite. The length and complexity of the password don’t matter, just the length of the key. Accent PDF Password Recovery can attack 40-bit encryption keys used for PDF files created in Acrobat 2-4 (the same approach can be used with Microsoft Office 97-2003 files). In later versions of Acrobat, key length was increased to 128-256 bits, meaning that key attacks take too long to be worthwhile. Numbers, graphs and articles are great, but they don’t show how well Accent PDF Password Recovery stands up against the competition. Some of the programs we tested don’t count because they weren’t able to support the test file, which was created in Adobe Acrobat X. The testing was conducted on an HP Pavilion dv7-6052er with Intel Core i7-2630QM processor @ 2.00GHz. Test files: Adobe Acrobat 7 format, Adobe Acrobat X format. How we selected programs to test: at download.com we did a search for "PDF password recovery" and sorted the results by popularity (link).